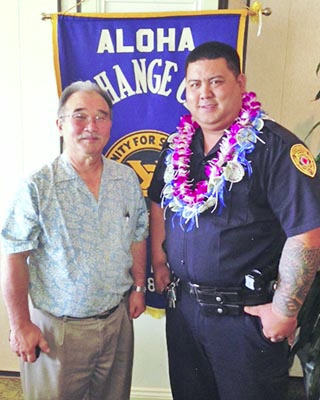 Aloha Exchange Club President Jay Kimura is seen with 'Officer of the Month' Jared Cabatu. The Aloha Exchange Club of East Hawaiʻi recognized South Hilo Patrol Officer Jared Cabatu on Thursday (March 28) as “Officer of the Month” for March. Cabatu was honored for his investigation of a fraudulent use of a credit card case. In November 2012, an elderly woman reported that her credit card had been stolen. 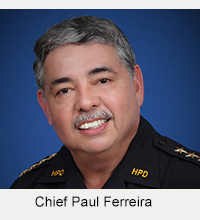 The stolen card had been used to make several purchases in Hilo totaling more than $1,000. 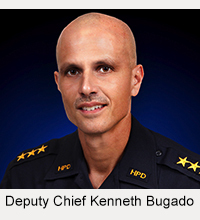 Through Officer Cabatu’s thorough and comprehensive investigation, he was able to establish the suspect’s identity and gain evidence that led to the arrest of a woman who was charged with theft of a credit card, forgery, fraudulent use of a credit card, theft and I.D. theft. Her bail was set at $40,000.